Solexy’s patented (7,057,105) Explosion-proof / intrinsically safe Ethernet Coupler which allows for transmission of Ethernet into hazardous areas with standard cables and connectors, has enhanced its offer for environments with extreme environmental severity, variety of installation options, and extended Hazardous Location approvals. The BAF/BXF series of Ethernet Barrier fittings eliminate the need for costly rigid conduit and seal type mechanical installations, or mineral filled cables, by converting the signal to one that is inherently Intrinsically Safe. This reduces all costs associated with design, engineering, installation and componentry. The BAF is designed for use in applications such as purged panels or safe areas while the BXF is flame proof and explosion proof, designed for entry fitment directly into an explosion proof enclosure. Both the BXF and the BAF allow for connect/disconnect in ‘hot’ areas which is ideal for programmers of Ethernet base communications, PLC’s and VFD’s. These recent enhancements provide ease of wired Ethernet installation where Intrinsically Safe and Explosion Proof requirements exist, easing the applicability to more users, for more applications, in more locations. The ambient operating temperature range has been extended to -40°C to +85°C (T4) and -40°C to +60°C (T5). 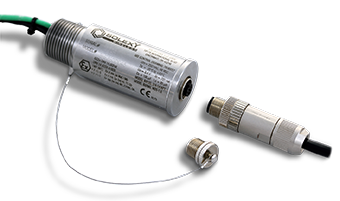 Installations requiring Metric thread (M25x1.5) are now available for certifications in USA and Canada in addition to ATEX/IECEx. Dual Certification Markings for Class/Division as well as Zones is now available for USA and Canada as Class I Div 1 and Zone 1. IECEx in Australia is now offered allowing ease of installation in industrial HazLoc’s as well as Queensland Mines.